How Did Baker Mayfield Prove He's Better Than Peyton Manning? Cleveland Browns quarterback Baker Mayfield didn't begin the season as the starter, but the No. 1 pick of the 2018 draft out of Oklahoma University tore opposing defenses to bits once he assumed the helm from Tyrod Taylor. Mayfield has been historic as a rookie and on Sunday, in a heart-breaking 26-24 loss to the Ravens he broke the rookie record for TD passes in a season with 27. Peyton Manning and Russell Wilson previously shared the record of 26. The 2017 Heisman Trophy winner entered a Thursday night NFL game between the Cleveland Browns and New York Jets in the second quarter when Taylor left the game with concussion symptoms. It was also the last time Taylor would ever start for Cleveland. Mayfield came out gunning, brought the Browns all the way back, turning in a dazzling performance in leading Cleveland to a 21-17 victory and ending the longest active winless streak among NFL teams. Mayfield also became the first quarterback to come off the bench in his official NFL debut, throw for more than 200 yards and lead his team to its first win of the season since Fran Tarkington did it with the Minnesota Vikings in 1961. 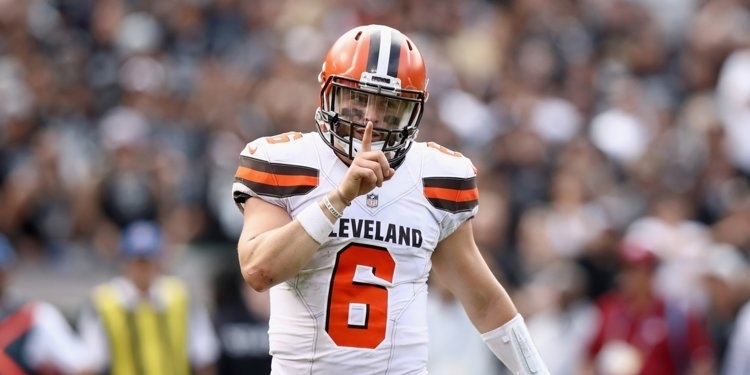 After going 1-31 in 2016 and 2017, Cleveland finished 2018 with an 7-8-1 record, winning three of their last four games and looking optimistically towards 2019.